These plastic freezer jars make preserving quick and simple! 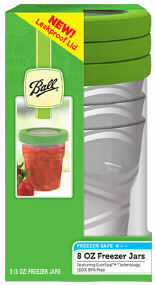 Ball Plastic Freezer Jars come in sets of three 8-ounce jars with twist on lids. The jars stack in the freezer, won't leak or spill, resist stains and are dishwasher safe! Jars are marked with fill line, no need to measure. More durable and convenient than plastic bags.